Wrought iron cuirass (2 – 3 mm) of the same type as that used by French cuirassiers, plated (up to 25 mm from the edge) with “red brass” (= copper). The cuirass comprises a breast- and back-plate, joined by shoulder parts. The breastplate (“plastron” in French) has a slight taper (“busc” in French, equivalent to the Mediaeval “tapul”) and the part at the neck has a gutter. The silvered border is garnished with brass nails used to fix the padding and cloth (“matelassure” and “fraise” in French) to the reverse side (these are absent from the Fondation Napoléon’s cuirass but present on that owned by the Musée de l’Armée). Following regimental tradition, this French Carabinier officer’s cuirass is decorated with a sun motif made of silver fixed by means of a brass star. The shoulder parts comprise fasteners (with lion motif) attached to three small chains mounted on light blue linen. The attachment plaques are stamped with leaves and a grenade (the blue linen shoulder parts and belt, with its silver braid, are not original). The belt, which is attached to the back-plate by rivets, is made of leather covered with blue textile, embroidered with three rays of silvered metal thread. 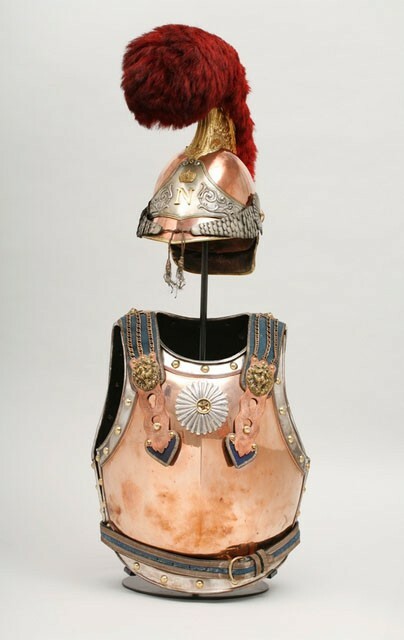 The helmet is “Greek-style”, and the domed part (or “bombe” in French) is covered entirely with “red brass” ending in a nape cover (“couvre-nuque” in French). The crest (“cimier” in French) is made of gilded brass stamped with palmettes, the whole topped with a scarlet horsehair plume. The front part of the helmet is decorated with a triangular silvered metal plate bearing an imperial crowned letter “N”, and on either side of this there is a pressed-metal vegetation decoration. Both of the cheek pieces are made of leather covered with 17 scales which increase in size up to the stamped boss. A single pin fixes the boss and the chin strap to the dome. The beading around the rim of the visor and the nape cover is engraved with flowers and foliage. The inside of the helmet is made of soft leather; this was usually sheep’s skin (“basane” in French). It was by a decree dated 24 December 1809 that Napoleon I decided to provide cuirasses for the two regiments of carabiniers. These elite heavy cavalry regiments, dating from pre-1789, had fought in the first Imperial campaigns in blue capes and bearskin busbies. These busbies were symbolic of the two regiments’ elite status but they were not very practical as they frequently fell off during combat, lacking as they did chinstraps, thereby exposing their owners to serious head injuries. The particular violence of the Austrian Campaign persuaded Napoleon that his caribiniers needed helmets and cuirasses. There just remained the small issue of encouraging the cavalrymen, with their historical sense of esprit de corps, to abandon the uniform that had so long been their pride and joy. The new garb was designed therefore to preserve the elite tradition and above all to maintain “a difference between carabiniers and cuirassiers” (art. 2 of the 24 December 1809 decree) whilst at the same time offering identical protection for both cavalry regiments. 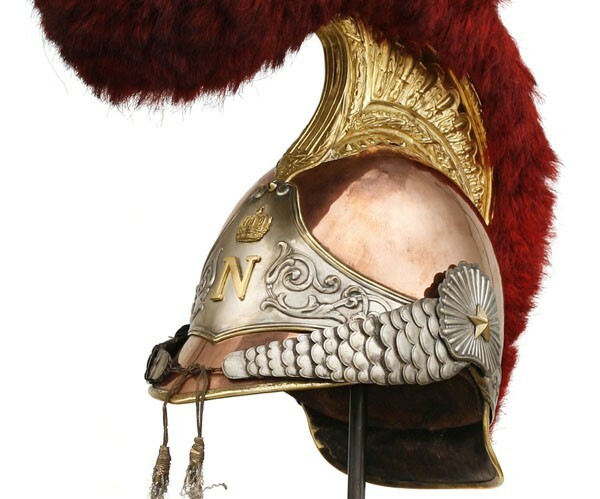 It is thought that the “Greek-style” helmet and scarlet plume were the Emperor’s own choice. The iron cuirass was plated with polished brass. As for the jacket, after deliberation, it was decided that it should be white with blue distinctive elements (collar, cuffs, cuirass garniture etc). It was not until April-May 1811 that the regiments were completely equipped. 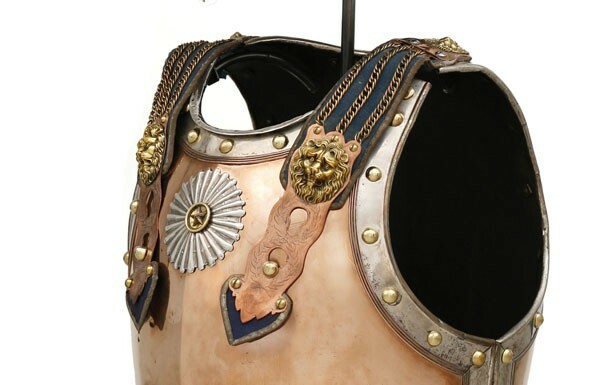 The cuirass did not actually belong either to rank-and-file or to officers but was considered one of the man’s arms and so remained government property; the sanction for losing your cuirass, like for losing your gun, was severe, and those affected were obliged to apply to the hierarchy for a replacement. As for the helmet, on the other hand, this was considered as part of one’s uniform, on the same level as shoes. Since a full uniform cost officers almost 2,000 francs, some regiments were obliged to advance their men money to help them afford the huge sum. These helmets and cuirasses were hailed by doctors of the period as a great contribution to defence against musket balls and sword blows. On the other hand, given the weight of the cuirass (7.5 to 7.8 kg including padding, about 1 kg heavier than a normal cuirassier’s breastplate), only the strongest of candidates could actually wear it comfortably. As for the helmet, it not only gave an impression of increased height but also looked great. Indeed, the head and torso ensemble flattered male egos. On the negative side, the high-sided helmet was prone to catching the wind during charges, and despite the leather lining and the chinstraps, it frequently fell off during fighting. Doctors also noted that during intense sunny weather the metal could get very hot. The inside of the (unventilated) helmet caused discomfort and headaches, whilst the cuirass caused excessive sweating. And the rubbing of the helmet over the years of a career could even cause early hair loss! Despite these drawbacks, this highly recognisable uniform (used in the campaigns from 1812 to 1815) was to remain almost unchanged until the end of the 19th century.